The Republic of Dagestan (older spelling Daghestan) is a republic of the Russian Federation, and is the southernmost part of Russia. Situated on the eastern end of the North Caucasus Mountains along the western shore of the Caspian Sea, it is the largest republic of Russia in the North Caucasus, both in area and population. 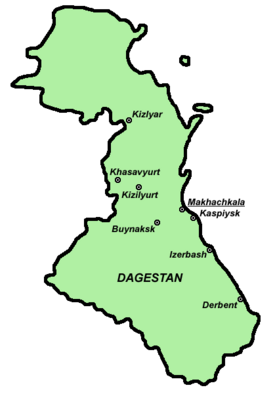 The word Dagestan means "land of mountains," it is derived from the Turkic word dağ meaning mountain and Persian suffix stan, meaning "land of." Dagestan has been long known as a religious area of Sufi Islam. After a period of religious repression under Soviet rule, Dagestan underwent an Islamic renaissance during the 1990s. By the late 1990s, it was the location of conflict between fundamentalist Islam known as Wahhabism, and the secular post-Soviet state. Dagestan borders the Republic of Kalmykia to the north, the Chechen Republic to the west, Stavropol Krai to the northwest, Azerbaijan to the south, Georgia to the south-west, and the Caspian Sea to the east. The land area is 19,420 square miles (50,300 km²), or about the size of Slovakia, or the combined size of the states of Massachusetts and Vermont in the United States. Dagestan comprises five geographical regions. The first region, which takes up the southern half of the republic, consists of the Caucasus Mountains, the crest of which marks Dagestan's southern border. The highest point of the territory is located here, at Mount Bazar Duzu, which is 14,652 feet (4466 meters) above sea level. To the north of the main mountain ranges is a triangle of rugged mountains known as the Dagestan Interior Highland. The second region, to the north of the mountains, is a zone of foreland hills, about 12 to 25 miles (19 km to 40 km) wide and rising to 2000–3000 feet (600–900 meters). The third region is a narrow coastal plain between the mountains and the Caspian Sea. The fourth area is a continuation of the coastal plain northward. The fifth region is a rolling, sandy plain called the Nogay steppe, as far as the Kuma River, which forms the republic's northern boundary. The climate is hot and dry in the summer, but the winters are hard in the mountain areas. The average January temperature in the lowland is 25.5°F (-3.6°C), while the average July temperature is about 74.3°F (23.5°C). Rainfall in the interior mountainous areas averages 20–30 inches (510–760 mm) annually, while rainfall in hot and dry north is with only 8–10 inches (200–250 mm). Terek River in North Georgia. There are over 1800 rivers in the republic. The Terek is a major river in the Northern Caucasus. It rises in Georgia near the juncture of the The Greater Caucasus Mountain Range and the Khokh Range, then flows north through North Ossetia and the city of Vladikavkaz, through Chechnya and Dagestan before dividing into two branches which empty into the Caspian Sea. Below the city of Kizlyar it forms a swampy river delta around 60 miles (100 km) wide. 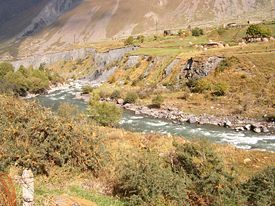 The river is a key natural asset in the region, being used for irrigation and hydroelectric power in its upper reaches. Other major rivers include the Sulak River, and Samur River. Large areas of the southern mountains are devoid of vegetation. The foreland hills have dense oak, beech, hornbeam, maple, poplar, and black alder, with a grass steppe vegetation on the lower slopes. Vegetation in the semidesert north is dominated by sagebrush. Dagestan is rich in oil, natural gas, coal, and many other minerals. The rivers are a potential source for hydroelectric power. The Caspian Sea is considered the ecologically most devastated area in the world because of severe air, soil, and water pollution; soil pollution results from oil spills, from the use of DDT as a pesticide, and from toxic defoliants used in the production of cotton. The capital, Makhachkala, population 462,412, is located on the western shore of the Caspian Sea. Makhachkala's historic predecessor was the town of Tarki, now a mere suburb, whose history goes back to the fifteenth century and possibly much earlier. The modern city of Makhachkala was founded in 1844 as a fortress; town status was granted in 1857. The original name of the city was Petrovskoye, after the Russian tsar Peter the Great who visited the region in 1722. The city sustained extensive damage during an earthquake on May 14, 1970. A lack of archaeological data makes it difficult to be specific about the history of the ethnic groups that occupy Dagestan. The earliest written records date from ancient Georgia and Armenia. Mountain dwellers have lived in remote areas scarcely accessible by the outside world, but isolation did not protect the region from invaders. It is possible to depict the ancient history of the region by describing the various societies that have occupied the territory. Approximate extent of Scythia and Sarmatia in the first century B.C.E. The Scythians, a nation of horse-riding nomadic pastoralists who spoke an Iranian languages dominated the Pontic steppe, a vast area stretching from north of the Black Sea as far as the east of the Caspian Sea, from around 770 B.C.E. to 660 C.E. 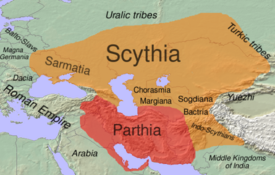 During the fifth to third centuries B.C.E., the Scythians evidently prospered, obtaining their wealth from their control over the slave trade from the north to Greece, although they also grew grain, and shipped wheat, flocks, and cheese to Greece. Westward expansion brought the Scythians into conflict with Philip II of Macedon (who reigned from 359 to 336 B.C.E. ), who took military action against the Scythians in 339 B.C.E. Scythian leader Ateas died in battle and his empire disintegrated. In the aftermath of this defeat, the Celts seem to have displaced the Scythians from the Balkans, while in south Russia a kindred tribe, the Sarmatians, gradually overwhelmed them. The Sarmatians were a people originally of Iranian stock. Mentioned by classical authors, they migrated from Central Asia to the Ural Mountains around the fifth century B.C.E. and eventually settled in most of southern European Russia and the eastern Balkans. The Sarmatians flourished from the time of Herodotus and allied partly with the Huns when they arrived in the fourth century C.E. Herodotus describes the Sarmatians' physical appearance as blond, stout and tanned—much as the Scythians and Thracians were seen by the other classical authors. Caucasian Albanians were one of the Ibero-Caucasian peoples, the ancient and indigenous population of modern southern Dagestan and Azerbaijan. Its capital was at Derbent, a city situated on a thin strip of land (three kilometres) between the Caspian Sea and the Caucasus mountains. Other important centers were at Chola, Toprakh Qala, and Urtseki. The northern parts were held by a confederation of pagan tribes. In 65 B.C.E., the Roman general Pompey invaded Albania at the head of his army. Between 83 and 93 C.E., in the reign of Domitian, a detachment of the Legio XII Fulminata was sent to the Caucasus to support the allied kingdoms of Iberia and Albania in a war against Parthia. During the reign of Roman emperor Hadrian (117-138) Albania was invaded by the Alans, an Iranian nomadic group. In the old town of Derbent, a World Heritage Site. In 252-253 C.E., Caucasian Albania along with Iberia and Armenia was conquered by the Persian Sassanid Empire (226-651). In the middle of the fourth century, the king of Albania was baptized by Gregory the Illuminator, but Christianity spread in Albania only gradually, and the Albanian king remained loyal to the Sassanids. Sassanian king Yazdegerd II passed an edict requiring all the Christians in his empire to convert to Mazdaism, (a form of Zoroastrianism) fearing that Christians might ally with the Roman Empire, which had recently adopted Christianity. This led to rebellion of Albanians, along with Armenians and Iberians. In a battle that took place in 451 in the Avarayr field, the allied forces of the Armenian, Albanian and Iberian kings, devoted to Christianity, suffered defeat at the hands of the Sassanid army. Many of the Albanian nobility ran to the mountainous regions of Albania, particularly to Artsakh (which became Ngorno-Karabakh), which became a center for resistance to Sassanid Iran. In the fifth century, the Sassanids constructed a strong citadel at Derbent, known henceforward as the Caspian Gates. In the middle of the seventh century C.E., Arabs overran the kingdom and, like all Islamic conquests at the time, incorporated it into the Caliphate. The Albanian king Javanshir, the most prominent ruler of Mihranid dynasty, fought against the Arab invasion of caliph Uthman on the side of the Sassanid Persia. Facing the threat of the Arab invasion on the south and the Khazar offensive on the north, Javanshir had to recognize the Caliph’s suzerainty. The Arabs then reunited the territory with Armenia under one governor. From the eighth century, Caucasian Albania existed as the principalities of Arranshahs and Khachin, along with various Caucasian, Iranian and Arabic principalities: the Principality of Shaddadids, the Principality of Shirvan, the Principality of Derbent, among others. Most of the region was ruled by the Sajid Dynasty of Azerbaijan from 890 to 929. Although the local population rose against the Arabs of Derbent in 905 and 913, Islam was eventually adopted in urban centers, such as Samandar and Kubachi (Zerechgeran), from where it steadily penetrated into the highlands. The northern part of Dagestan was overrun by the Huns, followed by the Eurasian Avars. Known as Sarir, this Avar-dominated medieval Christian state lasted from the fifth century to the twelfth century in the mountainous Central Dagestan highlands. Its name is derived from the Arabic word for "throne" and refers to a golden throne which was viewed as a symbol of royal authority. Sarir neighbored the Khazars to the north, the Alans to the east, the Georgians and Derbent to the south. As the state was Christian, Arab historians erroneously viewed it as a dependency of the Byzantine Empire. The capital of Sarir was the city of Humradzh, tentatively identified with the modern-day village Khunzakh. The king resided in a remote fortress at the top of a mountain. Due to Muslim pressure and internal disunity, Sarir disintegrated in the early twelfth century, giving way to the Avar Khanate. By the fifteenth century, Albanian Christianity had died away, leaving a tenth century church at Datuna as the sole monument to its existence. 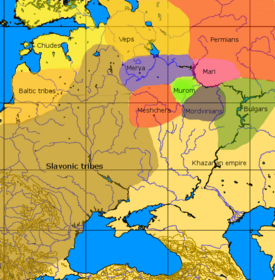 An approximate map of the cultures in European Russia at the arrival of the Varangians in the ninth century. Khazaria, also known as Khazar khaganate or Khazar khanate was the country of the Khazars, neighboring the Byzantine Empire in the southwest, Kievan Rus' in the northwest, Volga Bulgaria in the north, and Azerbaijan in the southeast. This Turkic people adopted Judaism in the eighth or ninth century, becoming the only Jewish state ever without Abrahamic descent. As an independent state, Khazaria existed between about 652 and 1016. Its supreme ruler was known by the title khagan. Its last khagan was named George Tsul. Much of Khazaria was covered by steppe land. Khazaria bordered the Caspian Sea and Black Sea. The Volga River (known as Atil) passed through eastern Khazaria. The Avar Khanate was a long-lived Muslim state which controlled Central Dagestan from the early thirteenth century to the nineteenth century. Following the downfall of the Christian kingdom of Sarir in the early twelfth century, the Caucasian Avars, who had migrated there from Khwarezm, underwent a process of peaceful Islamization. Military tensions escalated in 1222, when the region was invaded by the pagan Mongols under Subutai, the primary strategist and general of Genghis Khan. Although the Avars pledged their support to Muhammad II of Khwarezm in his struggle against the Mongols, there is no documentation for the Mongol invasion of the Avar lands. The Khanate of Avaristan survived Tamerlane's raid in 1389. As the Mongol authority gradually eroded, new centres of power emerged in Kaitagi and Tarki. In the sixteenth and seventeenth centuries, legal traditions were codified, mountainous communities (djamaats) obtained a considerable degree of autonomy, while the Kumyk potentates (shamhals) asked for the Tsar's protection. In the eighteenth century, the steady weakening of Tarki fostered the ambitions of the Avar khans, whose greatest coup was the defeat of the 100,000-strong army of Nadir Shah of Persia in September 1741. Avar sovereigns managed to expand their territory at the expense of free communities in Dagestan and Chechnya. The reign of Umma-Khan (1774-1801) marked the zenith of the Avar ascendancy in the Caucasus. Among the potentates who paid tribute to Umma-Khan were the rulers of Derbent, Shaki, Quba, Baku, Shirvan, Akhaltsikhe, and even Erekle II of Georgia. 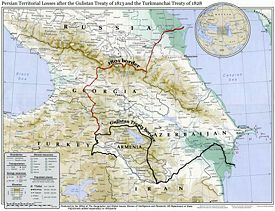 Russia-Persia borders before and after the treaty. 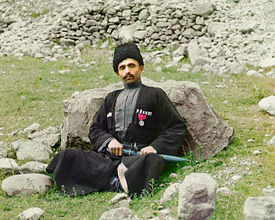 Dagestani man, photographed circa 1909 to 1915 by Prokudin-Gorskii and reproduced through digichromatography. Russians intensified their hold in the region in the eighteenth century, when Peter the Great annexed maritime Dagestan in the course of the First Russo-Persian War (1722-23). Although the territories were returned to Persia in 1735, the Persian Expedition of 1796, resulted in the Russian capture of Derbent in 1796. In 1803, within two years after Umma-Khan's death, the khanate voluntarily submitted to Russian authority, but it took Persia a decade to recognize all of Dagestan as the Russian possession (Treaty of Gulistan in 1813). Yet the Russian administration disappointed and embittered freedom-loving highlanders. Heavy taxation, coupled with the expropriation of estates and the construction of fortresses, electrified the Avar population into rising under the aegis of the radical Muslim Imamate, led by Ghazi Mohammed (1828-32), Gamzat-bek (1832-34), and Shamil (1834-59). The Caucasian Wars of 1718–1864, was a series of military actions waged by the Russian Empire against a number of territories and tribal groups in Caucasia including Chechnya, Dagestan, and the Adyghe (Circassians) as Russia sought to expand southward. The Russian invasion was met with fierce resistance, notably led by Ghazi Mollah, Gamzat-bek and Hadji Murad. Imam Shamil followed them. He led the mountaineers from 1834. In 1845, Shamil's forces achieved their most dramatic success when they withstood a major Russian offensive. Imperial Russia was distracted by the Crimean War (1853–1856). The Caucasian War raged until 1864, when Shamil was captured, when the Avar Khanate was abolished, and the Avar District was instituted instead. Shamil remained the figurehead of Dagestani nationalism. In the Russo-Turkish War (1877-1878), Russia sought to gain access to the Mediterranean Sea by capturing the Balkan Peninsula from the Ottoman Empire. Dagestan and Chechnya profited from this to rise against Imperial Russia for the last time. During the Russian Civil War (1917-1922), the region became part of the Republic of the Mountaineers of the North Caucasus (1917–1920), a short-lived state situated in the Northern Caucasus, later forming the republics of Chechnya, Ingushetia, North Ossetia-Alania, and Dagestan, of the Russian Federation. With a population of about one million, its capital was initially at Vladikavkaz, then Nazran and finally Buynaksk. After more than three years of fighting White movement reactionaries and local nationalists, the Dagestan Autonomous Soviet Socialist Republic (ASSR) was proclaimed on January 20, 1921. The ASSRs had a status lower than the republics of the Soviet Union, but higher than the autonomous oblasts and okrugs. Unlike the union republics, the autonomous republics did not have a right to disaffiliate themselves from the Union. Soviet rule was slow to become established. Until 1938, mountain paths were the only way out, and a linguistic barrier existed. In the mountains the old ways of life continued, and a national resistance movement remained active until the 1930s, instigating uprisings in the autumn of 1920 and the second in the spring of 1930. The nationalist movement was crushed during the process of collectivization in the mid-1930s. After World War II, the suppression of the mountain people continued through the educational system and Soviet cultural policy. Marxist-Leninist theory and the principles of collectivization were first conveyed to the Avars. Soviet leader Stalin's industrialization largely bypassed Dagestan and the economy stagnated, making the republic the poorest region in Russia. However, Dagestanis escaped the mass deportation inflicted on their Chechen neighbors and others in the Stalinist era. Since the Soviet Union collapsed, corruption increased, while oil and caviar mafias flourished. Kidnappings and violence became common, firearms were everywhere, and assassinations regular. Moscow blamed Chechen-based separatism, while others blamed profiteering, lawlessness, and a gun culture. Dagestani Muslims, who combine Sufism with local tradition, have tried to avoid the conflict that has afflicted Chechnya. But in the late 1990s, more radical and militant elements, linked with Wahhabism, gained influence. Chechen warlords led armed operations in Dagestan, first in 1995 and 1996, when Shamil Basayev and Salman Raduyev crossed the border and seized hundreds of hostages in hospitals in the Dagestani towns of Budennovsk and Kizlyar. There was tension in 1998, when two mountain villages near the Chechen border sought to introduce Shari'ah law. In 1999, Muslim fundamentalists under Basayev, together with local converts and exiles from the 1998 uprising, declared an independent state in parts of Dagestan and Chechnya, and called on Muslims to take up arms against Russia in a holy war. They also called for the arrest of Magomedali Magomedov, the republic's leader at the time, accusing him of working with the Russians. Hundreds of combatants and civilians died. Russian forces subsequently re-invaded Chechnya later that year. Since 2000, the republic has sustained numerous bombings targeted at the Russian military. Dozens died in 2002, when bombers targeted a Russian military parade in Kaspiysk, and Russian forces have since been the target of numerous smaller scale attacks. At least 10 died in a bomb blast in the capital, Makhachkala, in July 2005. Violence continued, with several people killed in multiple explosions and shootings through 2006, including Basayev, in an accidental explosion. Causes of the tension, while complex, were attributed to rampant corruption, poverty, and unemployment. Political structures in Dagestan have undergone various modifications—from the centralized kingdom of Sarir, to a nineteenth century association of aristocratic, and democratic republics, and to the centralized Soviet rule of the twentieth century. In 2007, the Republic of Dagestan was one of the 21 republics of the Russian Federation, all of which are reputed to have a high degree of autonomy. According to the Constitution of Dagestan, adopted in 1994, the highest executive authority lies with the State Council, comprising representatives of 14 ethnicities. The ethnicities represented there are Aguls, Avars, Azeris, Chechens, Dargins, Kumyks, Laks, Lezgins, Russians, Rutuls, Tabasarans, Tats, and Tsakhurs. The members of the State Council are appointed by the Constitutional Assembly of Dagestan for a term of four years. The State Council appoints the members of the Government. The Parliament of Dagestan is the People's Assembly, consisting of 121 deputies elected for a four-year term. The People's Assembly is the highest executive and legislative body of the republic. The chairman of the State Council was the highest executive post in the republic, and that position was held by Magomedali Magomedov until February 20, 2006, when the People's Assembly terminated this post and disbanded the State Council. Russian President Vladimir Putin had ethnic Caucasian Avar Mukhu Aliyev installed as the first President of Dagestan, a position he held until February 2010. Dagestan has 41 districts, 10 cities and towns, 19 urban settlements, 694 selsoviets (administrative unit), 1605 rural localities, and 46 uninhabited rural localities. Traditionally, law making and political control belonged to councils of elders, who represented the People's Council. Officials were selected annually. The council of elders designated a military leader. Leaders were bound by an oath on the Qu’ran. Traditionally, elected leaders and elders administered justice according to the written codices of customary law (adat), whereas the Quranic judges worked in terms of Qu'ranic law (Sharia). Punishments included fines, ostracism, and blood vengeance. Qu’ranic law functioned until the 1930s. Agriculture is the biggest economic sector, at 35 percent of the economy. Livestock raising is the main activity, especially sheep farming. Only 15 percent of the land is cultivable. Hillsides are terraced. Vegetables, cherries, apricots, apples, pears, and melons are grown in irrigated areas of the Terek River delta region and the coastal plain. Cereal crops include wheat, corn (maize), and rice. Fishing is important along the Caspian Sea coast. The Caspian is the source of what is considered the finest caviar in the world. Industry contributes 24 percent of GDP. Dagestan has oil and natural gas, coal, iron ore, nonferrous and rare metals, and hydroelectric-power resources, but the rugged terrain has limited development. Important industries are petroleum and natural-gas resources of the coastal plain near Makhachkala and Izberbash, machine building, power engineering, instrument making, the production of building materials, timber working, glassmaking, wine making, and food processing. Ironworking and rug making are traditional handicrafts. Construction made up 26 percent of GDP, services 9 percent, transport and communications 5 percent and other sectors 1 percent. Hydroelectric power is supplied by stations on the Karakoysu River, the Terek, and on the Sulak. Dagestan's major exports are petroleum, fish, wine, brandy, and various garden fruits. Dagestan has economic cooperation with Iran. Railways link Dagestan with Moscow, Baku, Astrakhan, and Gudermes. Sea routes cross the Caspian to Makhachkala, Dagestan's chief port. Unlike most other parts of Russia, the population of Dagestan, which was 2,576,531 in 2002, is rapidly growing. The terrirory continues to be the least urbanized republic in the Caucasus—42.8 percent is urban and 57.2 percent rural. Because its mountainous terrain impedes travel and communication, Dagestan is unusually ethnically diverse, and still largely tribal. A large number of the inhabitants still live in remote, often inaccessible mountain villages. Dagestan has the highest average life expectancy in the Russian Federation, which is 65.87 years for the total population. The largest nationalities are the 758,438 Caucasian Avars (29.4 percent), who live in the south and the west of the country; the 425,526 Dargins (16.5 percent) in the central regional; and the 336,698 Lezghins (13.1 percent), who live in the south. The smallest ethnic group (only 24,298 or 0.9 percent) is the Ratuls, who spread over four alpine villages in the south. In addition to the indigenous Dagestanis, there are some 120,875 Russians (4.7 percent), most of whom live in the capital, Makhachkala, and the other large cities. The Kumyks, who number 365,804 (14.2 percent), are a Turkic people occupying the Kumyk plateau in north Dagestan and south Terek, and the lands bordering the Caspian Sea. They practice folk Islam, with some religious rituals that trace back to pre-Islamic times. During the sixteenth, seventeenth, and eighteenth centuries C.E. the Kumyks had an independent kingdom, based at Tarki, and ruled by a leader called the Shamkhal. The Nogai People, 38,168 (1.5 percent), sometimes called Caucasian Mongols, are a Turkic people group, and an important ethnic group in the Dagestan region. They are descendants of Kipchaks who mingled with their Mongol conquerors and formed the Nogai Horde. They have scant beard growth, and are shorter than most people of the Caucasus. The average height for males is 160cm. They often have almond-shaped eyes, flat faces, high noses, and sometimes blue eyes. Azeris make up 4.3 percent, while there are 40 or so tiny groups such as the Hinukh, numbering 200, or the Akhwakh, who are members of a complex family of indigenous Caucasians. Notable are also the Hunzib or Khunzal people who live in only four towns in the interior. Other ethnic groups each account for less than 0.5 percent of the total population. With such ethnic diversity, 90.4 percent of the population adhere to the Sunni Muslims of the Shafi'i school, and are deeply Sufi. Christians account for the remainder. Though Islam had spread north into the Caucasus and Central Asia during the Arab invasions of the seventh and eighth centuries, Sufism penetrated Central Asia in the twelfth century and into the northern Caucasus in the early eighteenth century. Its success was in great part due to its ability to adapt some local beliefs or customs into Islam. Dagestan has been long known as a religious area. Before the 1917 revolution, Dagestan had 1700 ordinary mosques, 356 cathedral mosques, 766 Qu'ranic schools (madrassahs), and more than 2500 mullahs. During the Soviet era, most mosques were closed, and the mullahs harrassed. But although religious practice was banned, the public continued such rites as marriage, burial, and circumcision in the Islamic way. Dagestan underwent an Islamic renaissance during the 1990s. Concentrated rebuilding meant that by 2003, 1091 cathedral mosques and 558 ordinary mosques were in use. There were 16 Islamic universities, 141 madrassahs and 324 schools attached to mosques. Dagestani Sufi Islam is intellectual in orientation, is non-aggressive, and regards the concept of jihad as a personal struggle for self-improvement. Salafi, or fundamentalist Islam, appeared in Dagestan in the late 1980s, with two branches—radical and moderate. The radical branch, known as Wahhabis elsewhere in the Caucasus region, adopted a more formal structure, and is known as Muslim Jama'at. The spiritual leader was Bagauddin Muhammed. Muslim Jama'at's beliefs were put into practice in two villages in central Dagestan from 1997-99, attracting numerous followers. They regard post-communist as being in a state of paganism, want to ban the sale of alcohol and tobacco, and want to set up Islamic moral police. The appearance of the Wahhabis, who have been active in Central Asia and Muslim regions of the Caucasus, has caused resentment among the various Sufi orders. 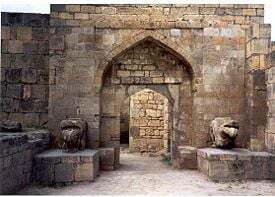 Sufi masters especially object to the Wahhabis, who are teaching that these masters and the tombs of previous masters do not deserve any special respect. The Wahhabis have a reputation for going beyond simply teaching its form of Islam. The group is usually well funded, helps construct mosques, and brings in Korans printed in local languages. The Wahhabis, generally, receive their funding from Saudi Arabia. Each of Dagestan's 33 ethnic groups has its own distinct language. The three main linguistic groups are Turkic, Persian, and aboriginal Caucasian, a complicated language, leading specialists to believe that its speakers always lived there. The people practice what linguists call vertical polylingualism, in which the ethnic group inhabiting the village at the top of the mountain speaks its own language or dialect, plus the language of the village below. Russian is the lingua franca, though before the 1917 revolution it was Arabic. In 1938, the alphabets of all Dagestani nations with a written language were converted to Cyrillic. The Avar language belongs to the Avar-Andi-Tsez subgroup of the Alarodian Northeast Caucasian language family. The writing is based on the Cyrillic alphabet, which replaced the Arabic script used before 1927 and the Latin script used between 1927 and 1938. More than 60 percent of Avars living in Dagestan speak Russian as their second language. The Dargin language has three principal dialects, and Dargwa peoples use a modified version of the Cyrillic alphabets to write their language, which is one of the literary languages of Dagestan. 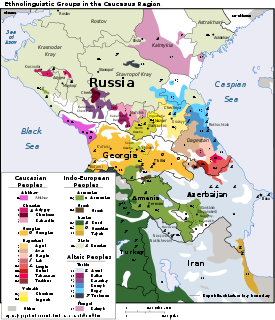 Lezgi belongs to the Northeast Caucasian (Dagestan) language family, is not an official language, but is one of six literary languages of Dagestan. Kumyk is a Turkic language, spoken by about 200,000 Kumyks in Dagestan. Kumyk was written using Arabic script until 1928, Latin script was used in 1928-1938, and Cyrillic since then. Dagestanis, like most mountain people, are a hardy breed. Both women and men are small, slight, and wiry, with narrow hands and feet and chiseled features. The greatest sign of beauty and status is acknowledged to be a mouthful of glittering gold teeth. The veil was never worn in Dagestan. Women lower their eyes in the company of men. 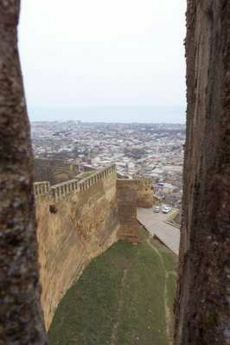 Wall of the Derbent citadel, the only Sassanid fortification in existence. Marriage outside tribal or ethnic groups is discouraged, but intermarriage is becoming more common among urban dwellers and between members of certain villages. Traditionally Avars marry at about age 15. The parents take most responsibility in the selection of a partner, although a young man can say who he wants to marry. First cousins may marry, and girls do not marry a young man of lower social rank, or someone outside the village group. Avar wedding ceremonies are quite elaborate, accompanied by folk dances, folk music,and sometimes horse races. The traditional clan organization is called the tukhum in most of Daghestan. The tukhum is patrilineal, and divides into smaller groups the Avars call "the people of one house." The clan and the village constitute the basic units of Avar society, with councils of elders and village courts. They also form the basis of Sufi brotherhoods. In the Soviet period, a registered civil marriage became obligatory. The newlyweds lived with the husband’s parents, but with separate living quarters. In divorce, the woman traditionally retained all her dowry, and the children remained with the father. This Sharia-based custom was changed to follow Soviet law so that the children remained with the mother. The formal right to divorce used to rest with the man, but now a marriage can be dissolved by either party. Polygamy was traditional and has resurged after the collapse of the Soviet system. The Avars, unlike other peoples of the Caucasus, lived in nuclear families. Inheritance was from father to son, while women inherited one-third of the total inheritance, although Avars, especially urban dwellers, followed Soviet laws. Russia's free, widespread and in-depth educational system, inherited with almost no changes from the Soviet Union, produces 100 percent literacy. Preschool education is well developed, with four-fifths of children aged three to six attending day nurseries or kindergartens. School is compulsory for nine years, from age seven, leading to a basic general education certificate. Two or three years are required for the secondary-level certificate. Non-Russian pupils are taught in their own language, although Russian is compulsory at the secondary schools. Avar society was segmentation into classes. A clan-based aristocracy (nutsbi) constituted a patrician class, while freed and the serfs (or "slaves") made up a lower class. Under Russia, a new aristocracy emerged based on service, and after the 1917 Revolution society was divided into workers, peasants, and intellectuals. Traditional class divisions persisted into the Soviet period, when communist elites had special access to goods, services, and housing. Since the Soviet Union collapsed, oil and caviar mafias flourished. 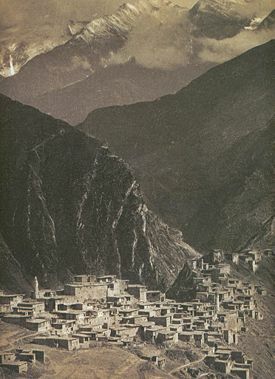 The village of Tindi, in Daghestan, in the late 1890s. The photograph was taken by M. de Déchy, who returned from the area with large collections of plants, fossils, and photographs. The Soviet regime gradually altered Dagestan’s traditional way of life by destroying mosques, persecuting the clergy, using Russian as the language of instruction in schools, and enforcing adoption of European-style civilization. A European style has became widespread in clothing, household appliances, technology, and architecture. Younger generations gradually lost contact with the old ethnic culture, Soviet customs gained in popularity, the number of mixed marriages increased, and people migrated to the plains and industrial centers. Avar settlements consisted of a single complex building—a whole mountain village may consist of a single building. Streets ran like tunnels, sometimes at two levels below the houses. A settlement had several quarters, each of which had its place for meeting and worship. The quarters organized work and elected commune leaders. Houses were built in tiers, so settlements were terraced. Livestock shelters were placed at the edge of the village. Dwellings had several floors, a quadrangular shape, and a flat roof, although slanting roofs constructed of slate and iron have predominated since the 1960s. Deep porches faced south. The lower floors were used for business. Under the Soviet regime, state-owned apartment buildings with a very unpretentious architecture housed urban dwellers. Many apartments were small and shared, with joint-access kitchens and bathrooms. Dagestan is known for bronze embossing, textile manufacture, and silk spinning. The village of Untsukul has become famous for its woodworking products with silver inlay. Khingal is the Dagestan national dish of small dumplings boiled in ram's broth. Depending on the cook's nationality, the dumplings can be oval or round, filled with meat or cheese, and served with a garlic or sour cream sauce. Dairy products and meat constitute a large part of the diet in the mountainous regions, while in the valley zones vegetables and grain flour are eaten, as well as fruits, edible gourds, edible herbs, and wild grasses. 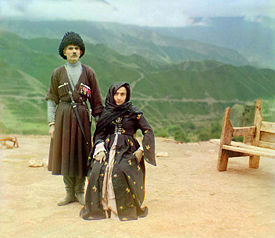 A couple in traditional dress poses for a portrait in Dagestan. Photographed by Sergey Prokudin-Gorsky, c. 1907 to 1915. Dagestani men are known for traditional leather boots and wasp-waisted, tight-fitting tunics. To make their waists even smaller, they bind their tunics with the skin of a freshly slaughtered sheep. The bourka, a shaggy, full-length cape made with layers of felt to resist rain—and bullets—is an all-purpose mountaineer's outfit. Other clothing includes pants, a shirt, a quilted coat, a long, narrow, collarless coat, a sheepskin coat, a cowl, a fur cap, leather shoes, and socks of felt or wool. Traditionally, Avar men from the age of 15 were entitled to wear a saber, rifle, dagger, and pistol, although since the 1930s, carrying and possessing arms has been forbidden. However, since the Soviet period, clothing, particularly for men, resembles ordinary European civilian clothing. Women's clothing varies from one region to another in Avaria. On the chukht (headdress) were sewn silver ornaments, different for each community. Rural women also wear long-sleeved floral dresses over full pantaloons. Epic-historical songs about the defeat of the armies of Persian Nadir Shah and various episodes of the nineteenth century wars are popular among the Avars. Best-known are the ballads "Khochbar" and "Kamalil Bashir." In the second half of the nineteenth century and the beginning of the twentieth, Avar culture and literature underwent a significant upsurge. Well-known Avar literary figures include the poets Aligaji of Inkho (who died 1875) and Chanka (1866-1909), the lyric poet Makhmud (1873-1919), the satirist Tsadasa Gamzat (1877-1951), and the celebrated poet Rasul Gamzatov (born 1923). Among his poems was Zhuravli, which became a well-known Russian song. Avaria, perhaps more than any other part of Dagestan, was a centuries-old seat of Arabic culture with many scholars, visited by disciples from other Muslim nations. There is a Dagestani Philharmonic Orchestra and a State Academic Dance Ensemble. Gotfrid Hasanov, who is said to be the first professional composer from Dagestan, wrote Khochbar, the first Dagestani opera, in 1945. Dagestani folk dances include a fast-paced dance called the lezginka. It derives its names from the Lezgin people; nevertheless, Azerbaijanis, Circassians, Abkhazians, Mountain Jews, Caucasian Avars, the Russian Kuban, and Terek Cossacks and many other tribes have their own versions. McEvers, Kelly. 2006. Dagestan Diarist—Enemy at the Gates. The New Republic. 38. United States, Robert Bruce Ware, and Zulfia Kisrieva-Ware. 2000. The Situation in Dagestan. Washington, DC: The Commission. The Peoples of the Red Book. Radio Free Europe discusses religious tension in Dagestan. This page was last modified on 18 November 2017, at 22:47.